The booming of emerging technology is an obvious global feature of today’s S&T development at the same as it is also becoming a key factor in the national R&D programs. Considering this, how to describe the dynamic development path of emerging technology via visualization including market, product and technique elements should be considered seriously by both governments and enterprises. Organizations operating in competitive environments demanding process improvements, new product introductions, or technology-enhanced services must obtain and use information on emerging technologies. Therefore, the research on emerging technology and its dynamic development trend is significant in both theoretical and practical ways. 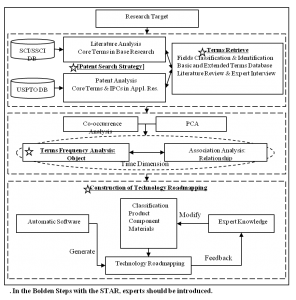 Accordingly, technology roadmapping, which should be considered a flexible technique that is widely used within industry to support strategic and long-ranged planning, is introduced into the research of technology assessment and forecasting. Technology roadmapping emphasizes visualization as a method to describe the technology development path and provide a structured means to explore the relationships between evolving and developing markets, products and technologies over time. Currently, the research on technology roadmapping pays attention mainly to the qualitative methodology. Meanwhile studies neglects the objectivity of quantitative methods or struggle to determine how to blend the two methodologies together. Time dimension: the advent of the objects and their relationships. Expert knowledge should be introduced into the hybrid model as an important and necessary step, with which the information retrieved from massive databases could be modified to ensure both the objectivity and authority of related research results. 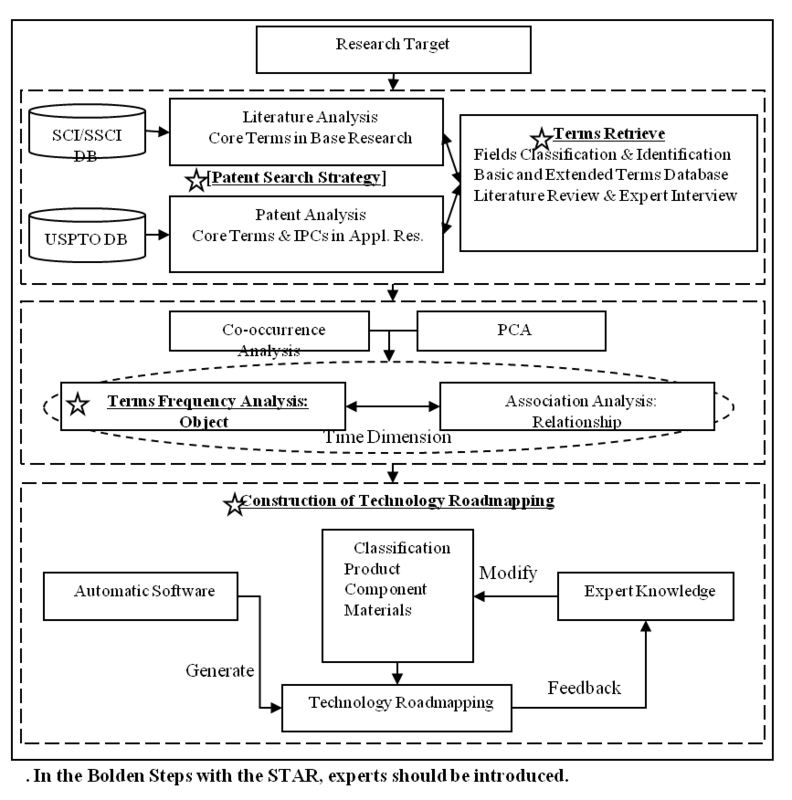 The framework of the hybrid composing model for technology roadmapping is illustrated in Fig. 1. After the definition of the research target, separate literature and patent analyses based on the SCI/SSCI database and the USPTO database are used to retrieve core terms and IPCs. It is really important to set up an exact terms database as precisely as possible; in this condition, a special “Terms Retrieve” should be combined. In the second step, a terms frequency analysis and an association analysis should be realized by automatic software, and objects, relationships and time dimension of technology roadmapping could be generated. The last step is the construction of technology roadmapping with the support of expert knowledge and a software platform. The classification of objects will help to locate them in the graph more intelligently. In addition, the multiple feedbacks and modifications with experts help to improve the authority and practicality of this model. Moreover, an empirical study of the global nanotechnology development is used as an example to illustrate the hybrid model for composing technology roadmapping.